Freelang translators can help you for free if you need to translate a short text in Norwegian. Norwegian – The Language of Creativity? Norwegian is a North Germanic language spoken primarily in Norway by about 4.7 million people. It is more or less mutually intelligible with Swedish and Danish. There are two official forms of written Norwegian: Bokmål (literally "book language") and Nynorsk (literally "new Norwegian"). Bokmål is the form generally used in public media and taught to foreign students. It is based on the language spoken by the urban upper and middle class in East Norway, whereas Nynorsk is based on the dialects and is more common in rural areas. However, a lot of people that use Nynorsk are educated people with an affinity for traditions and culture. They claim that Nynorsk is a richer language which represents more the real Norwegian language, as opposed to Bokmål which is based on Danish. Since most public media is in Bokmål, most people find it easier to learn: a 2005 poll indicates that 86.3% of Norwegians use primarily Bokmål as their daily written language, whereas 7.5% use primarily Nynorsk, and 5.5% use both. Bokmål is used in 92% of all written publications and Nynorsk in only 8%, but all governmental agencies are required to support both written languages. Download our free dictionary (for Windows or Android) and browse both the Norwegian-English and the English-Norwegian lists. Look up a word, add or modify an entry, and learn words at your own rhythm from a personal learning list. Click here to learn more about the features or scroll down to download the program. An online version is also available, so you can browse the dictionary without downloading it. Many thanks to Shelly Daum for the last updates. 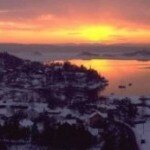 Norwegian in 5 Minutes a Month provides free lessons to learn Norwegian online. If you are interested in genealogy, we found this dictionary of commonly used words in genealogical research.